Bottles and other items get broken and, out at sea, the action of the water knocking the pieces of glass against sand and gravel, gradually grounds off the smooth top surface. This leaves the glass looking milky and smooths off any sharp edges. 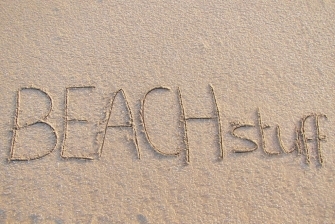 This produces what is known as beach glass or sea glass. 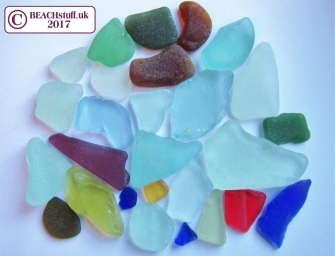 The most common sea glass colours we find are clear (which turns milky white through the abrasive action of the sand), green and brown simply because those are the most commonly used colours of glass in bottles. It is thus always good to find glass which is a different colour, simply because of its relative rarity. There is a beach in Russia which is famous for its sea glass. 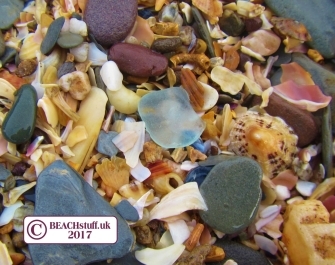 It is thought that a nearby glass factory threw its waste glass into a river, which transported it to the sea where it was worn down into smoother pebbles and dumped on the beach. The whole beach is now a multicoloured treasure trove of glass. Read more about it on this website. 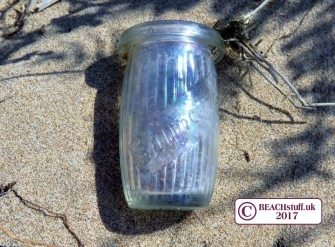 Remarkably, sometimes intact glass items can be found. Perhaps these come out of dunes more often than they are washed up but they are a satisfying find. 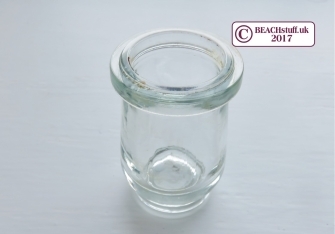 These little sandwich paste jars are one of the more common glass objects, perhaps their size and relatively thick glass means they are more likely to survive. Shippams, the brand on the striped jar famously made sandwich meat paste for many years. The company itself started in Chichester in 1786 and the brand continues today having been bought by Prince's in 2001. Before you rush off to the Antiques Roadshow to get your paste jars valued, those with the name Shippams on were first produced in the 1930s but remained in production until the 1970s. 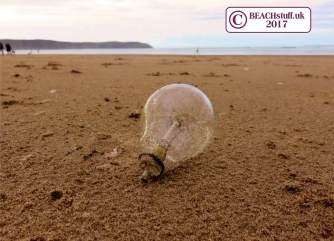 It never ceases to amaze me how many intact light bulbs end up on the beach. They must be washed in but how do they survive the rigours of life on the waves? And it's not just standard household style bulbs but also strip lighting can be found. I learn from fantastic groups like facebook's 'Lost at Sea' that some lucky people are finding old glass stoppers and beautiful marbles etc. However, as I have never found such things I cannot show you them here. If some one would like to donate photographs of the glass items they have found, I would be very happy to feature them here.